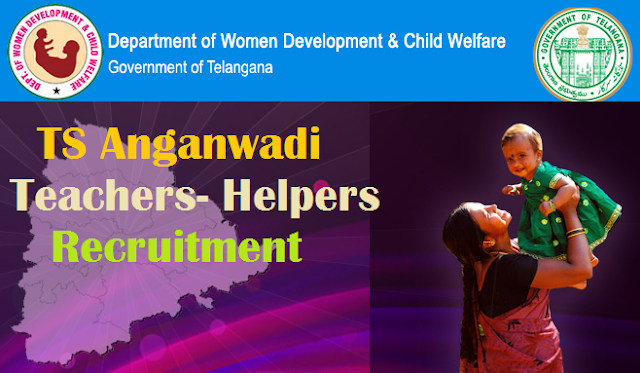 TS Anganwadi Teachers/Helpers Recruitment 2019 District Wise Vacancies-Online Application Form : TS Anganwadi Notification 2019 Apply Online WDCW Telangana Anganwadi Teacher Worker Jobs Recruitment. Anganwadi Teachers, Anganwadi Helpers Recruitment 2019 by ICDS Telangana: District Women, Children Welfare Department, Hyderabad District, Telangana has issued Anganwadi Posts recruitment 2019 notification on February 21, 2019 for filling up the posts of Angawadi Workers (Anganwadi Teachers), Anganwadi Helpers (Aayas), Mini Anganwadi Workers (Mini Anganwadi Teachers)in the Hyderabad District. Eligibility Criteria for Anganwadi Teachers, Anganwadi Helpers Recruitment 2019. Recruitment Notification of AWT/AWH Women Development and Child Welfare Department of Telangana Recruitment Notification District wise Vacancies Online Application form Selection Process How toApply Online /Apply Online through mis.tgwdcw.in/ recruit website address. WD&CW Dept. - ICDS - Selection procedure AWTs, Mini AWTs and Helpers Selection Process,TS Anganwadi Female Worker vacancy details. For the holistic development of the child, the Department has been implementing the world's largest and most unique and outreach programme of Integrated Child Development Services (ICDS) providing a package of services comprising supplementary nutrition, immunization, health check up and referral services, pre-school non-formal education. There are 35,700 Anganwadi Centers functioning in the State in 149 ICDS Projects. Selection procedure through Online Anganwadi Recruitment Software Application. హైదరాబాద్‌ జిల్లాలోని మహిళా, శిశు, దివ్యాంగుల, వయోవృద్ధుల శాఖ పరిధిలోని ఐదు ఐసీడీఎస్‌ ప్రాజెక్టుల పరిధిలో ఖాళీగా ఉన్న మెయిన్‌ అంగన్‌వాడీ టీచర్లు, మినీ అంగన్‌వాడీ టీచర్లు, అంగన్‌వాడీ సహాయకురాళ్ల పోస్టుల భర్తీకి అర్హులైన మహిళా అభ్యర్థినులు దరఖాస్తు చేసుకోవాలని అధికారులు తెలిపారు. Anganwadi Teachers, Anganwadi Helpers Recruitment 2019 by ICDS Telangana. Selection Procedure for Anganwadi Workers, Anganwadi Helpers Recruitment 2019, How to apply for Anganwadi Posts Recruitment 2019, Online application Form link of Anganwadi Workers, Mini Anganwadi Workers, Anganwadi Helpers Recruitment 2019, Last date to apply for Anganwadi Teachers, Aayas Recruitment 2019 and more details would be available on ICDS Telangana Website.